Started week three of the Ultimate Reset today. I’m down 12 pounds so far. Felt much better and had more energy today than I did during the entire week 2. I’m not sure if its because the supplements changed or what. I do not miss taking the detox packets. Instead, we add the Revitalize capsules to the mix. Breakfast was, you guessed it, fresh fruit. Asian Cabbage Salad with Miso Soup for lunch. 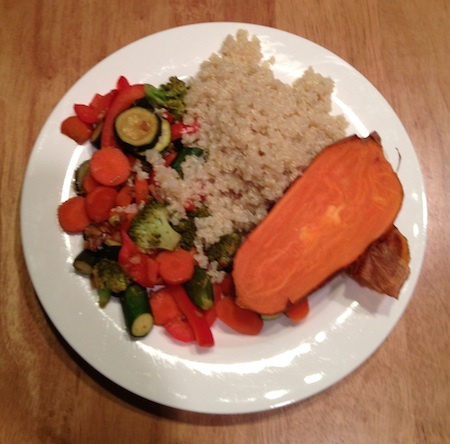 Baked Sweet Potato, Garlic Veggies, and Quinoa for dinner. All three meals tasted great.